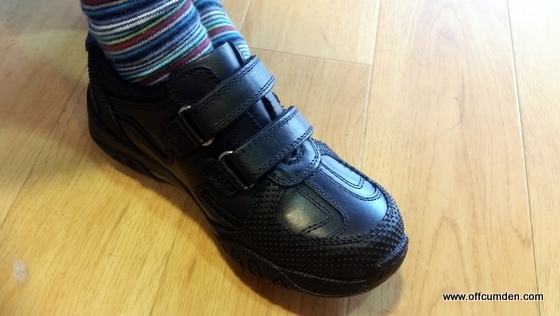 My son goes through school shoes incredibly quickly. In his first year at school he got through three pairs, and two pairs in his second year. I am hoping that this year he will cut it down to just one! We usually go to our local town for him to be fitted, either to an independent shop, or to Clarks. 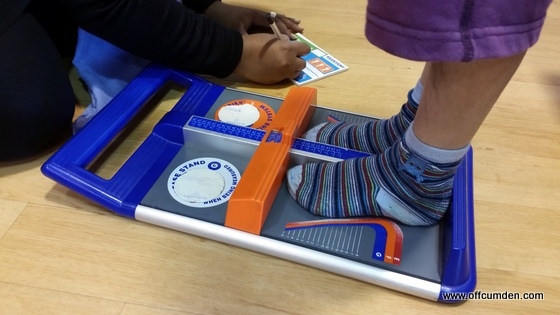 However, we were invited by Brantano to try out their expert shoe fitting service ahead of the children starting back at school in September. 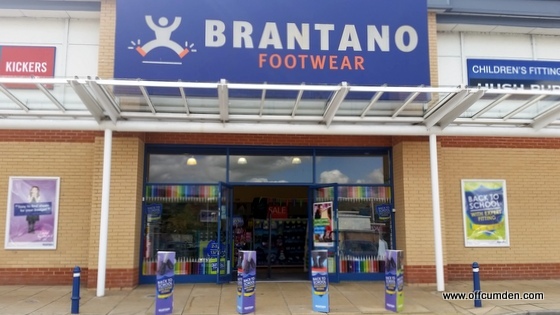 I knew I would need to get some shoes for both children, and although I hadn't considered Brantano, I was interested to see how it differed to other places we have been. 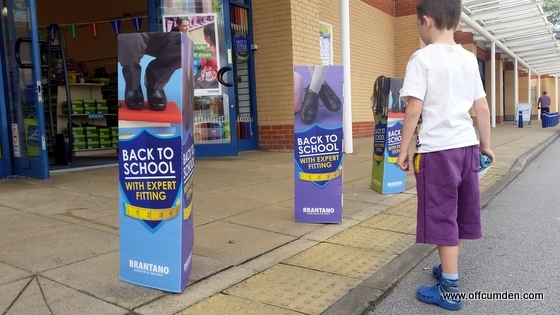 We visited Brantano in Keighley, which is our nearest store. First impressions were good. The store was clean and the staff were really friendly. We must have been there at a good time as it wasn't too busy. My daughter's behaviour was less than desirable, and the staff ignored her perfectly! She came round in the end, but was initially unwilling to try on any pairs of shoes. I was fairly certain my son's feet had grown (as they so often do)! The measurements proved me right. He had gone up nearly a whole size since he had last been measured. I like that the staff write the details on a card and give that card to your child. It made my son feel very important to hold this special card in his hand! It's a nice personal touch. The fitting really was excellent. Staff took time to make both children feel at ease. The lady who was with us was wonderful and had great conversations with the children. My son chose some lovely shoes, but they didn't have any scuff protection at the front, and I knew they wouldn't last long. He plays football in every break at school and as such his school shoes suffer! In the end he opted for a pair of Hush Puppies. They have a rubber scuff protector and I think they will last a lot longer than his previous pairs! After a walk around in them, the staff realised they were a little too big, but they added in an insole and they fitted perfectly. I will have to remember to take the insole out as his feet grow. The whole experience from start to finish was very easy. The staff were happy to help and listened to what both my children and I wanted. My only slight bugbear is that they sell soft toys as I somehow managed to leave with two small soft toy keyrings! I would highly recommend Brantano for school shoes (and soft toys)! Next on my list of things to do is to work out how on Earth I am going to manage to get my daughter's hair looking half decent every day at school. It's generally tough enough just getting to brush it, let alone manage to style it too! I am enjoying watching the videos top hair stylist Charlotte Hayward has put together for Vosene Kids. I am hoping this dad-proof hair style works for mums too as I will definitely give it a go! I would never have thought of looking to YouTube for hair style information, but I certainly will be doing in the future. Disclosure: We received one pair of shoes free of charge for the purpose of this review. I paid for the other myself. This had no impact on this review, which is honest and fair.